It is an unintended consequence for the states that have legalized pot: More children showing up in emergency rooms. But it's not for smoking pot -- it's eating it. WASHINGTON — It is an unintended consequence for the states that have legalized pot: More children showing up in emergency rooms. But it’s not for smoking pot — it’s eating it. “I don’t think people thought about what we are seeing in the emergency rooms,” says Dr. G. Sam Wang, a pediatric emergency physician and medical toxicologist at Children’s Hospital in Colorado. Young children are “getting into marijuana products and coming in with various degrees of symptoms and illness,” he says. Wang was part of the discussion when the state was trying to figure out the rules and regulations for retail recreational marijuana. He says child resistant packaging was suggested for the pot infused edibles since it had worked so well for other pharmaceuticals. That may be a good idea, but children are drawn to the colorful packaging, inviting nibbles to the creative types of products that contained pot. Brownies, cookies, candy and even beverages now had the psychoactive component of marijuana, THC or tetrahydrocannabinol, inside them. 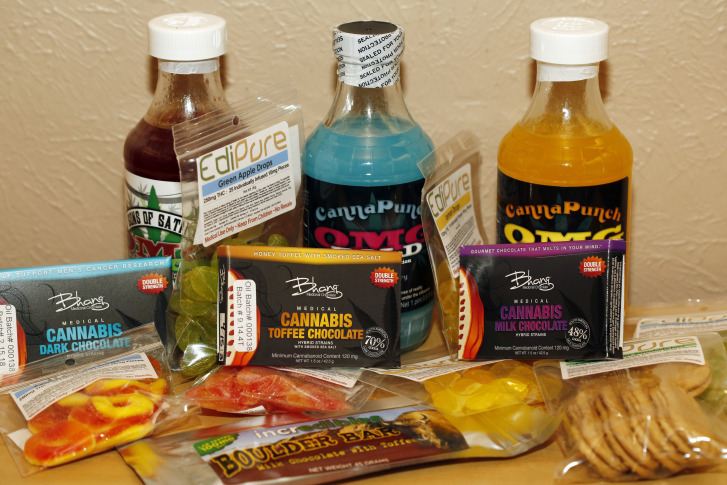 Skyler McKinley, Colorado’s deputy director of marijuana coordination says vendors who produce and supply the edibles are licensed by the state and must follow strict guidelines on packaging, labeling and potency. But what about that young child who, rather than seeing a warning label, sees an inviting cookie or piece of chocolate? Wang says this poses a unique challenge and a public health problem. He cites ER statistics of 8-10 children coming into the hospital per year prior to 2014. “But we saw about 13 in the emergency room, I believe that’s the unofficial number in the first seven months of 2014,” says Wang. Recreational marijuana became legal on Jan. 1, 2014. McKinley says the legalization of marijuana and all of its successes and failures is a work is progress and ever-changing. Meanwhile, emergency regulations that go into effect this year include getting edible manufacturers to submit test batches for potency testing, require single serving edibles in a child resistance package before it is shipped and regulate the total amount of THC in each item. But McKinley says parents need to take a stronger role.